Let Redplug help reduce the noise from the neighbours or the children!! 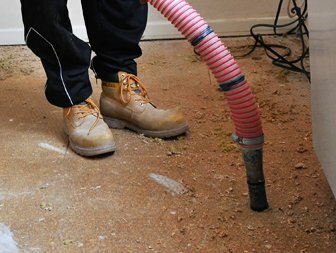 With all the information on this website we felt it was worthwhile giving a greater insight to what we offer and why, with regards to nuisance noise and so-called soundproofing. First of all, we are NOT acousticians and we do not offer a technical acoustic service although we are slowly developing a network of contacts with the correct level of technical expertise to pass on relevant enquiries to. 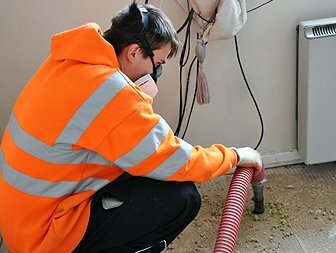 After repeated requests from a range of clients a few years ago to ‘blow some Rock into our voids to try and help with the noise from above/below’ it became apparent to us that there was an opportunity to develop a new sector of work for our very special skills within the nuisance noise market. It has taken us several years to fully optimise what we do and how we do it by utilising this glorious naturally occurring mineral to solve what some people find to be a little bit more than a ‘nuisance’. There are many other solutions on the market all developed and installed to mitigate nuisance noise problems and our solution is not perceived as a competitor but an addition to the arsenal of products to counter nuisance noise. And a very good addition it is too. Well, blown Rockwool and that’s it really. High rise, small void, large void, ceilings, floors, door frames, service shafts, stud work, ducts, pipes, you name it we’ve probably done it. 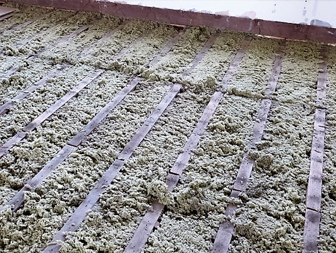 Rockwool material being filled between joists. Because it works! For us Rockwool has two very unique factors. Its ability to resist/dissipate heat and its longevity. To counter sound transfer across a given void we need to remove/reduce the inherent energy (heat) in the sound wave while also confusing and disrupting the signal. 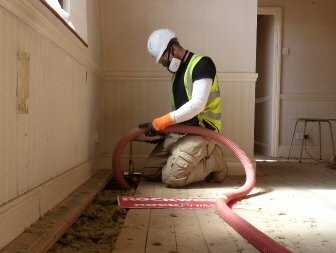 Rockwool is extremely thermal efficient and because of this maximises the potential to remove the heat energy from the sound signal which when added to the ‘matting effect’ created by the blown system, this helps to disrupt the signal as well. Well, we use a very specialised and calibrated machine to mix compressed Rockwool material and blow it into the void where we are trying to reduce the sound transfer. We can do this over some quite reasonable distances in built environment terms. We typically know the volume of the void in question and through the machine set up and some calculations we know how much material we need to install to achieve the minimum density expected to maximise the sound reducing performance. In all manner of building types but the best performance is found in older solid wall structures where any flanking noise is minimised. We regularly install into converted solid wall properties and get excellent feedback on performance. This does not mean that we don’t work on more recent builds or even new builds because we do. Empty cavity walls are always a problem in newer properties as it accentuates the flanking noise problem when ceilings or floors are filled. New builds are a real problem but we have regular successes all the same. We hope the above offers a little clarity on what, how and why we do what we do but if you need further information or are in need of costs for your own noise reduction project, please take a look at our twitter feed for recent examples of blown insulation installations @mickredplug or take a look at the videos on our website at www.redplug.co.uk.